PUZZTRIX brings to mind classical games such as Puzznic or Brix. The goal is simple: Eliminate all colored objects! 1. All movable objects are under the force of gravity. 2. If two or more objects are adjacent to each other, they "evaporate". 3. Movable bricks do not count as objects. Thus they do not have to be eliminated, actually they cannot be eliminated. The cult game of the old C'64 and Amiga days is back. 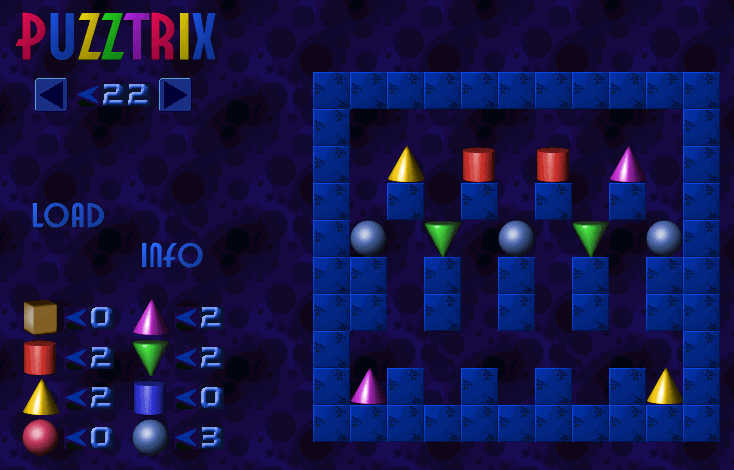 Puzztrix, as it is called now, runs under Windows, and is based on the same ingenious principles of its role model Puzznic: Eliminate all game objects from the screen! Whenever two or more similar objects are adjacent, they are "evaporating". Gearz Game - We pleased to announce the release of its newest mind-warping action puzzler, free download Gearz Game to have a try ! High Roller Game - An action puzzle game with a classic 1950's muscle car theme. Holiday Express - Help deliver colorful gifts, Holiday Express Game for you !